Cervical spine anatomy includes 7 small vertebrae, intervertebral discs to absorb shock, joints, the spinal cord, 8 nerve roots, vascular elements, 32 muscles, and ligaments. The nerve roots stem from the spinal cord like tree branches through foramen in the vertebrae. Each nerve root transmits signals (nerve impulses) to and from the brain, shoulders, arms, and chest. A vascular system of 4 arteries and veins run through the neck to circulate blood between the brain and the heart. Joints, muscles, and ligaments facilitate movement and serve to stabilize the structure. Cervical pain of the neck is a common medical condition. Cervical pain can come from a number of disorders and diseases of any tissues in the neck. Examples of common conditions producing cervical pain are degenerative disc disease, neck strain, neck injury such as in whiplash, a herniated disc, or a pinched nerve. Cervical pain can come from common infections, such as virus infection of the throat, leading to lymph gland swelling and neck pain. Neck pain can also come from rare infections, such as tuberculosis of the neck and bone infection of the spine in the neck (osteomyelitis and septic discitis), and meningitis (often accompanied by neck stiffness). Cervical pain can also come from conditions directly affecting the muscles of the neck, such as fibromyalgia and polymyalgia rheumatica. 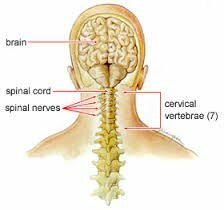 Risk factors for cervical pain include injury from involvement in contact sports, motor vehicle accidents, bull or bronco horse riding, etc. Cervical pain that is muscular, discogenic, or arthritic in nature. Patient may be experiencing limited ROM of C-spine or have pain referred to the trapezius or upper extremity. Radiograph of the spine if cervical pain started with trauma. Do not prescribe muscle relaxants as they are not effective. Soft collar not recommended except for 1-5 days s/p high speed whiplash trauma (i.e., MVA). Appropriate activity limitations on lifting, overhead work, heavy headgear, etc. Ice packs every 20 minute q2h x 72 hours – then change to heat PRN. Should observe a reduction in pain level within 5-7 days. Chronic upper trapezius tension may persist for up to 2 months. Expect increased AROM of C-spine and decreased muscle spasm within 2 weeks, complete resolution will take longer. Chronic conditions with a stable neurologic exam in patients that have been evaluated by Orthopedics or Neurosurgery and are not surgical candidates.